The virtue of a champion player is to bounce back from the worst of adversities and Joe Root did exactly that. 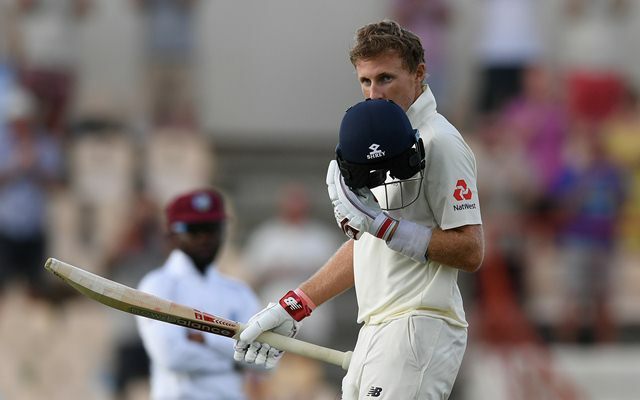 English Test skipper Joe Root finally got amongst the runs in the second innings of the third Test against the Windies. He registered his 16th Test ton in the match and is stood on Nelson at the end of day’s play. After a string of poor scores, this innings comes as a relief for the 28-year-old. England now extended the lead to a mammoth 448 runs and have got complete control over the game. The England openers, who survived the final passage of play on day-2, resumed the innings on the third day. However, Keemo Paul dismissed Rory Burns on the first ball of the day. After having built a decent partnership with Joe Denly, Keaton Jennings was clean bowled for 23 runs. Then Joe Root joined hands with Denly and added over 70 runs together. The Kent all-rounder finally paid back the faith that the management put in. He got to his maiden half-century in the fourth innings of his career but failed to capitalize. Shannon Gabriel managed to find his bottom edge which carried through to the keeper. However, this 69 from Denly might have just sealed the number three spot for the upcoming Ashes. Then, Joe Root built another wonderful partnership with Jos Buttler. This duo put on 107 runs combined which ended up frustrating the Windies bowlers. However, it was the second new ball that did the trick for the home team as Kemar Roach broke the partnership. It was a peach of a delivery that was angled into the right-hander. But, after pitching, the ball moved away. It missed the outside edge of Buttler and disturbed his timber. He scored 56 runs in the innings. Joe Root and Ben Stokes are still batting out there in the middle. Root is unbeaten on 111 and they might look to bat at least for one session on day-4 before Windies bat in the last innings of the game. Twitterati was thrilled with this brilliant knock from Root and applauded him for the heroics. Joe Root scored a massive 55 runs in 5 innings with stellar average of 11, lost the series 2-0 before this meaningless century. What a wonderful 💯 scored by Joe Root! Joe Root ends the day 3 unbeaten at 111.